I HAVE TO SHARE THE REST OF MY HALLOWEEN PICTURES BEFORE IT'S THANKSGIVING! 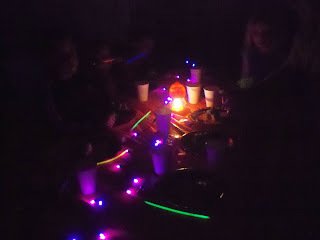 WE DID A HALLOWEEN PARTY FOR THE KIDS OVER AT AMBER'S HOUSE. CELESTE WAS DOWN VISITING AND CAROL LOVES TO PARTY, SO THEY SET UP A COOL LITTLE PARTY FOR THE KIDS; COMPLETE WITH DECORATIONS, FOOD, AND GAMES. 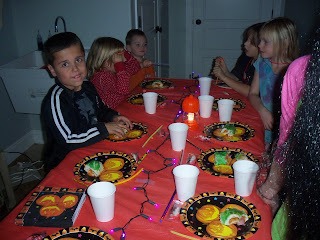 DARREN AND CAROL DECORATED THE MUD ROOM INTO A SPOOKY DINING AREA FOR THE KIDS. 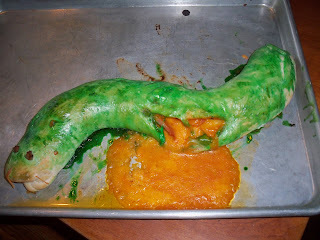 AMBER COOKED UP SNAKE, AND IT WAS FABULOUS HOW IT SPLIT AND SPILLED IT'S GUTS! 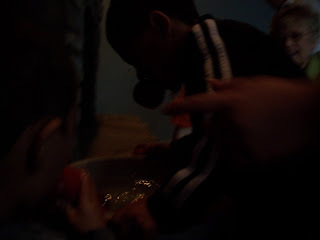 THE KIDS WERE A LITTLE HESITANT TO EAT, BUT AFTER THEY TASTED, IT WAS GOOD. WE LET THEM BOB FOR APPLES. 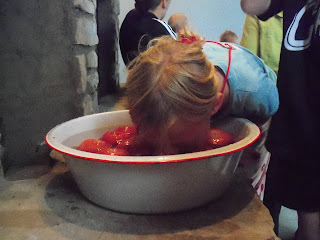 THAT WAS PRETTY FUNNY, ALL THESE KIDS, ONE BIG BOWL OF APPLES....YUCK. 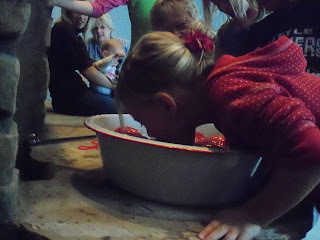 :) THEY SURE HAD FUN THOUGH. 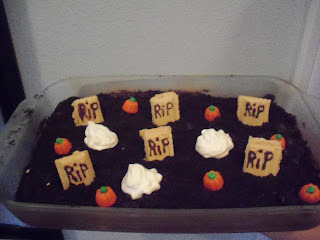 OUR GRAVEYARD DESSERT TURNED OUT GREAT. AMBER MADE THE GRAVEYARD WITH PUDDING AND CHOPPED UP COOKIES AND I DECORATED IT WITH TOMBSTONES AND GHOSTS...YES THOSE WHITE THINGS ARE SUPPOSE TO BE GHOSTS....I TRIED. 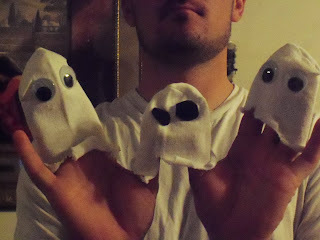 WE ALSO MADE GHOSTS OUT OF SOCKS. I BOUGHT SOCKS AND WE CUT THE BOTTOMS OFF AND THEN GLUED EYES ON THEM. 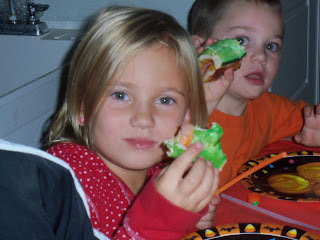 THEY WERE SUPER CUTE. Sounds like lots of fun. I just sent Christmas pkg. Be looking for it. Cute! I want that snake recipe. That was super gross and fun. My kids would love that.